The use of LIDAR technology may sound an unlikely field for the amateur archaeologist, but the recent release of Government LIDAR data on the internet has now made this a possibility. LIDAR, which stands for Light Detection and Ranging, is a remote sensing method that uses light in the form of a pulsed laser to measure ranges (variable distances) to the Earth. These light pulses—combined with other data recorded by the airborne system— generate precise, three-dimensional information about the shape of the Earth and its surface characteristics. A LIDAR instrument principally consists of a laser, a scanner, and a specialized GPS receiver. Airplanes and helicopters are the most commonly used platforms for acquiring LIDAR data over broad areas. Two types of LIDAR are topographic and bathymetric. Topographic LIDAR typically uses a near-infrared laser to map the land, while bathymetric lidar uses water-penetrating green light to also measure seafloor and riverbed elevations. A major advantage with LIDAR over other forms of aerial photography is the ability to strip out extraneous details such as trees, or even modern housing. The images on the right demonstrate the advantages of LIDAR over conventional aerial and satellite photography. The top image shows a satellite image of a site in Savernake Forest. 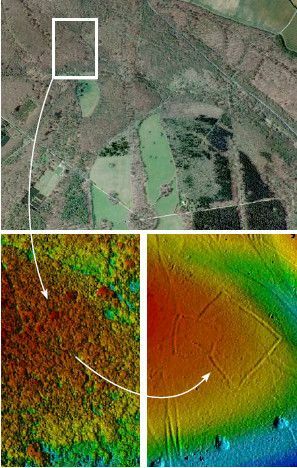 The LIDAR image (bottom left) shows considerably improved detail in terms of fine gradations in elevation and the image bottom right shows the LIDAR image after processing to remove vegetation which revealed an Iron Age construction. If you are interested in this subject, there is a useful tutorial on the web: Processing UK Environment Agency LIDAR Data Tutorial.